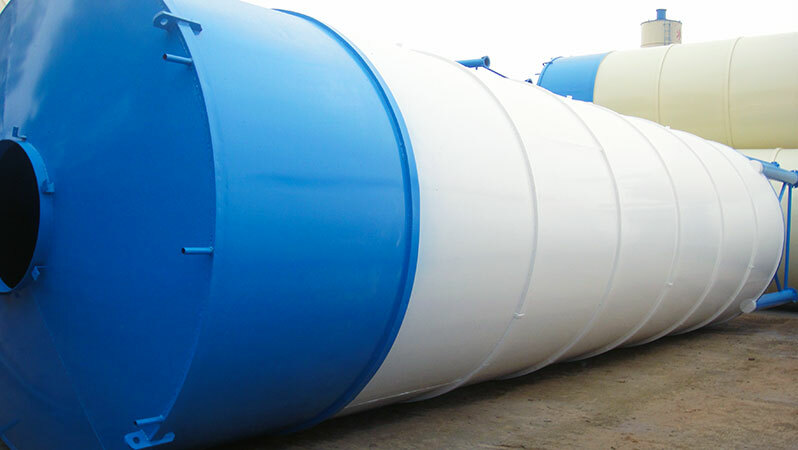 Cement silo is the storage equipment, which is a very important part of concrete batching plant. So how to choose the right cement silo for your concrete batching plant? Which kind of the cement silo is good enough for your concrete batching plant? What kind of questions should be attention while you choose it? Here we introduce you something about it for reference. There are two Types of cement silo in our factory. Welded and Bolted, of course, we named them depend on the produce technical. Welded which means we finish produce in factory, each parts are welded together before loading you, and you can use it directly while you receive it. Of course, you should build the suitable base for the cement silo once you receive it. Advantage for this model: no need do the rebuild while you receive it, easy to installation. And bolted, we produce each parts in factory, and loading you all the parts to your place, you have to build them together with the bolted first. And then do the following jobs as the welded model. Advantage for bolted model: easy for transport and save transport charges. There are many models of cement silo in zhenheng for you choose while you have decision to build a concrete batching plant. 50T,100T,150T,200T 300T. or we can arrange and develop with your special requirement. Of course, choose the suitable model of cement silo is depend on what’s capacity of concrete batching plant you want to build. How many cement silo needed while you build a concrete batching plant is a common question that nearly all the customer want to know. First, you should to confirm how many kind of powder materials you use. As cement, fly ash, slag, etc. Each kind of powder materials need a storage. Second, how long away does the cement factory from your concrete batching plant, if close, there are no need too many numbers. But not, need more to make sure the production smoothly.